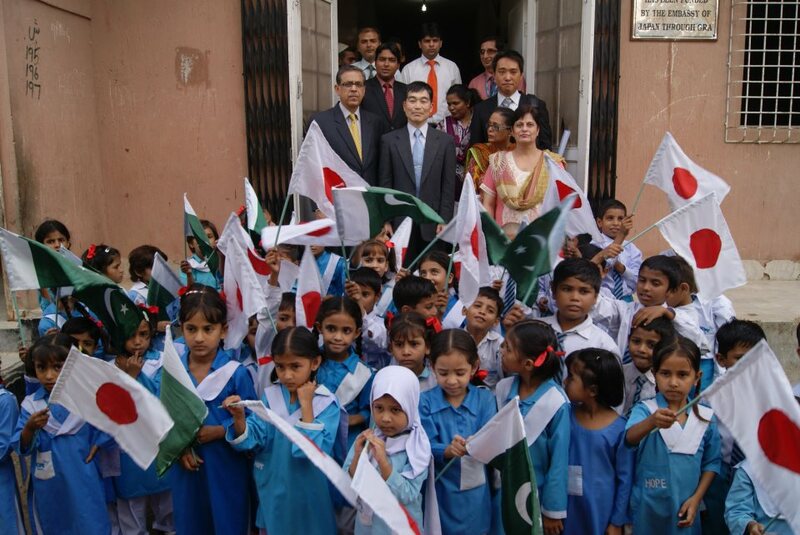 Japanese join hands with HOPE Pakistan to keep hope afloat! Hope is an imperative feeling to have, but more importantly to GIVE. Giving someone hope is like giving them a reason to live and not to give up. The greatest gift we can give someone is our own joy. Taking this perception along, HOPE tries to reach out to all those who no one reaches out to and aims to give them hope for a better life and a better future. 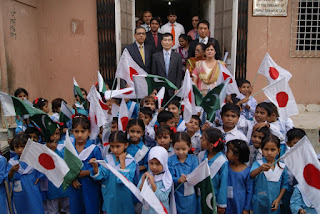 In this regard, HOPE Pakistan in collaboration with Japanese government built up a Formal School in Korangi, Karachi, which was inaugurated in 2006, targeting the underprivileged children of the community. Since then HOPE has been providing quality education to hundreds of poor children, making them capable enough to compete the world, lead a better life and be beneficial for the society. Currently, more than 750 students are enrolled in the school. HOPE considered upgrading and expanding the school to cater more underprivileged children so as to spread free education to as much children as it can. For that reason, Consulate General of Japan once again demonstrated its support and love for the Pakistani people and approved the project. 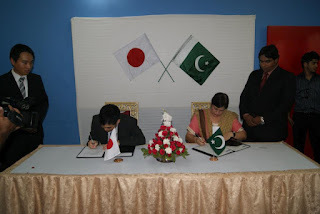 Hence, a grant contract for the up-gradation was signed today by the Acting Consul General of Japan Mr. Masamichi Abe and the chairperson of HOPE Dr. Mubina Agboatwalla. This up-gradation includes new rooms, improved vocational center and availability of conveyance for the staff and students. Moreover, students will be able to go to field trips as well as visit other schools. 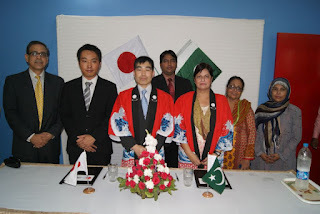 The consul general Mr. Masamichi Abe not just signed the contract but also took a round of the school along with Mr. Yuki Ochiai (Vice Consul for Political & Economic Affairs) and interacted with the students. The Japanese delegation expressed immense gratification with the work done by HOPE so far and assured their support in the future as well. HOPE students all set for the World Space Week Competition!! The United Nations General Assembly in 1999, declared 4 to 10 October “World Space Week” to celebrate the contribution of space science and technology to the betterment of the human condition. World Space Week is observed in almost 89 countries around the globe with the objective to educate people about the benefits that they receive from space, excite young people about science and gather public support for space programs. In this regard, SUPARCO is organizing a National Level Water Rocket Competition and a Poster Making Competition with the World Space Week (WSW) theme of 2012 "Friends in Space". This is the 3rd Annual National Water Rocket Competition organized by SUPARCO in 11 cities all over Pakistan. HOPE formal school in Zia colony is also preparing its students for this upcoming competition. The main purpose of this competition is to polish artistic capabilities of students, and to sharpen their skills in craft work and to promote space awareness and interest among students. For the Water Rocket Competition, a workshop was held on 12 September 2012 at SUPARCO to train the teachers about the competition. The HOPE School, Zia Colony, faculty also participated in the workshop. The faculties there were asked to make a water rocket. The HOPE School faculty followed all the instructions, showed their creativity and demonstrated their work which made it possible for the HOPE School's students to get selected in the competition. In this competition, the schools are required to submit three posters painted by the students, aged between 8-11 years old on “Space Friends” by using mixed mediums such as oils paints, water colors, color pencils and computer drawing. Similarly, 11-15 years old students are participating in making of Water Rocket. Students will design Water Rockets meeting specific construction and launch criteria, which either hit the target or have a minimum ground distance from target and also have the most aerodynamic structure. Only one teacher will be part of the competing team, accompanying the students. The practice of making of Water Rocket will be on 25thOctober 2012 at SUPARCO, Karachi, while, the posters will be submitted on 20th September 2012, and the craft work will be submitted on 4th October 2012 and on the same day, the date for the result ceremony will be announced. HOPE students are working very hard to win this competition. HOPE believes participating in different competitions will increase the students' confidence level. These students are from the underprivileged families and HOPE is providing them free education and equal opportunities for a better life ahead. HOPE aims to give them a ray of hope for a better future and to make them realize they are not any less than others who have all the facilities of life. For this purpose, HOPE Schools have been actively participating in several on going activities to make their students courageous, confident and bold, so that they could compete with other students. HOPE believes these students will positively contribute for the betterment of society and make everyone proud of them. 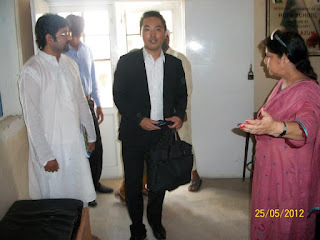 Upgradation of HOPE School and Vocational Center, Zia Colony, Karachi. Every day adds up a little more to life. With HOPE Pakistan, thousands of people in despair are getting privileges everyday, which helps them keeping their hopes alive. HOPE does not focus on only one aspect of life, in fact, it believes in integration and aims to provide quality education and health with vocational training to the underserved. HOPE's mission is to develop a society in which individuals are aware of their basic rights and are provided with equal opportunities to access health, educational and vocational facilities. HOPE believes in educating the masses and providing them vocational training so that with education, they can also acquire skills to get better job opportunities. Taking this viewpoint along, HOPE built a formal school in Zia Colony, Korangi, which was inaugurated in 2006, targeting the underprivileged children of the community. Since then HOPE has been providing quality education to hundreds of children, making them capable enough to compete the world, lead a better life and be beneficial for the society. Therefore, HOPE deems upgradation a necessary step in order to keep up with the advance educational system. Though, it has been made sure that such up-gradation should not affect the fee structure (i.e. Rs. 60 per month) so that children belonging to underprivileged families could continue their education. HOPE provides them with free uniform, texts-books, stationary and health facilities as well. Other than that, the vocational center has also been set up in Zia Colony which helps providing income generation activities. HOPE’s project “Upgradation of HOPE School and Vocational Center, Zia colony, Karachi” has been approved by the government of Japan. This project will begin in September 2012 and it consists of building new rooms, improving vocational center and availability of conveyance for the staff and students. In this regard, 12 more rooms will be built. Students will be able to go to field trips and also they can visit to other schools. 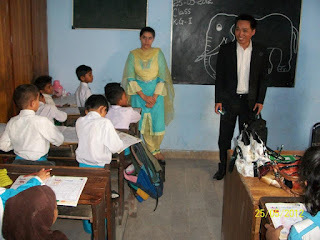 So that they could interact with other schools' students and avail the facilities offered by those schools, such as computer labs, Science labs etc. Currently 750 children are studying in the morning and evening shifts and through this project 250 more students will be able to get enrolled in HOPE Zia Colony School. Additionally, HOPE considers the safety of its school children as a primary concern. Therefore, in this regard, it will be made sure that children will not enter into the premises where the construction is taking place. Since majority of the construction will take place on the roof, therefore, that area will be cordoned off. Hence, the project will not only be beneficial for the students of school but also for the boys and girls who are getting free vocational services. This project is a constructive step towards building an educated, healthy, skilled and self-aware society, which is the vision of HOPE!